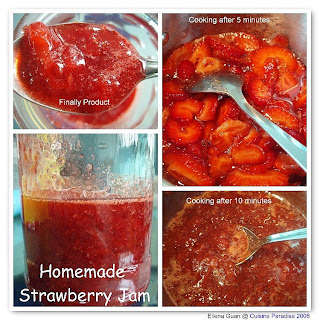 I didn't realised that actually making Strawberry Jam is so fun and easy until I gave it a try over the weekend break. These homemade jam is so fresh and tasty from the fresh strawberry that is in season. You can read more on my making process of the jam at this link. Other than serving these freshly made jam on the usual toast or pancake, I decided to try using it to make a dish. 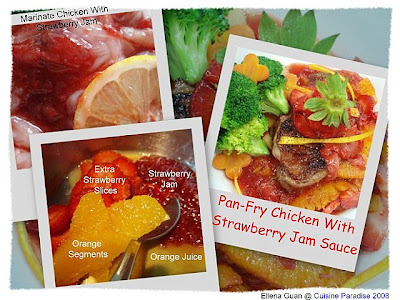 I marinate the boneless chicken thigh with some strawberry jam and orange segment to with it. 1. Wash and trim the fat on the chicken thighs, pat dry and marinate it with all the ingredients and set aside in the fridge for at least 30 minutes or more. 2. Preheat a frying pan with some olive oil, drained the chicken thighs well then pan-fry it with skin side down for about 5 minutes(depend on the thickness and size) then turn over to cook the other side. 3. When both side are cooked through with slight brown in colour, remove and arranged on serving plate. 4. Prepare the sauce and drizzle it together with the fruits over at the side of the chicken. 5. Served with extra vegetables, salad or mashed potato. 1. Place all the ingredients except the orange in a small saucepan then simmer till almost boil then add in the orange segments and stir till it begin to boil again. It had being quiet sometime for me to post topic relating to soup since my last post on making Lotus Root, Pumpkin and Pearl Bean Soup in May 2008. 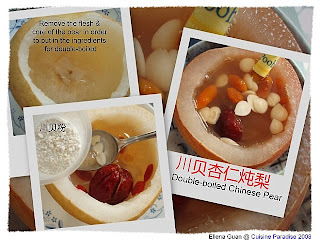 Today's Soup will be Double-boiled Chinese Pear, it more for nourish of lungs and ease of dry cough. My dear son has being having bad cough for the past one week and after completing his medication he still doesn't seems to have much improvement and the cough is also getting worst. So rather than continue with the western medication, I decided to make him this remedial for cough using some of the Chinese herbs shown below. Warm. Influences the lung and large intestine channels. Stops cough and moistens the intestines. Commonly used to treat dry cough and constipation. Cool. Influences the heart and lung channels. Dissolves phlegm and dissipates nodules. Commonly used to treat chronic cough with yellow or bloody phlegm that is difficult to expectorate. Neutral. Influences the liver, lung and kidney channels. Nourishes the essence, brightens the eyes, enriches Yin and moistens the lungs. Commonly used to treat anaemia, sore lower back, vision problems and long term cough. Cool. Influences the lung and stomach channels. Stops cough, generates fluids and nourishes the skin. Commonly used to treat bloody cough, dry mouth and throat, and dry, itchy skin. I have made this soup continuous for two days with two different methods. 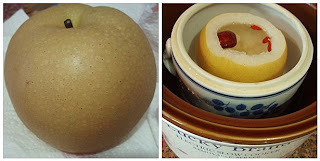 The 1st method will yield a more concentrated amount as I have put some of the ingredients within the pear shell and double-boiled it for it fullness effect. While 2nd method I just placed all the ingredients in a double-boiled and make a more dilute soup. Both me and my dear son prefer the 1st method as it is more sweet, fragrant and concentrated on it's content. 1. Wash the snow pear and cut a small portion off on top and use a spoon to scoop out the core and the flesh to make a pear cup. 2. 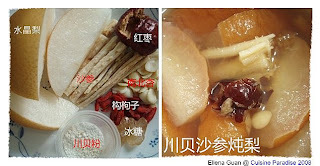 Wash the herbs and put it into the pear cup together with the rock sugar and Chuanbei Powder. 4. Double-boiled it for about 2 to 3 hours in a slow cooker and served warm or you can double-boiled it over a stove in a pot for about 30 - 45 minutes over low heat. a) Chuanbei powder can get from most Chinese medical hall. Usually I will buy $5 and ask them to grind into powder. If for kid consume it can be divided into 4 serving amount, you can check with the person in the medical hall for more details. 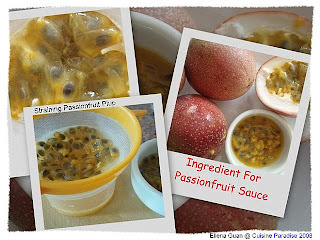 Cooking with Passion fruit is never to come across my thought as I don't really have passion with this fruit. But after hearing good comments from my friend Tracy on this fruit, I decided to give it a try and at one go I have whipped up a main course and a dessert to pair with it. 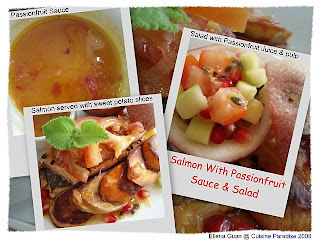 So today's Menu will be Salmon With Passion fruit Sauce served with Passion fruit Salad and PassionMisu(recipe) here for dessert. The passion fruit is round to oval, yellow or dark purple at maturity, with a soft to firm, juicy interior filled with numerous seeds. The fruit can be grown to eat or for its juice, which is often added to other fruit juices to enhance aroma. Fresh Passion Fruit is known to be high in vitamin A, Potassium and dietary fibre. Passion fruit juice is also a good source of ascorbic acid (vitamin C). 1. Cut all the items into similar shape and sizes then mixed them together and set aside in the fridge. 2. Scoop the salad into the reserved passion fruit shell. a) You can use whatever fruits and vegetables that is in your fridge but try to choose those with mild favour to compromise with the passion fruit taste. As for the main course, I used salmon fillet to accompany the fragrant of the passion fruit sauce and it really blend well with this combination. This salmon dish consists of 3 portion of preparing method for the fish, sauce and side dish. You can use any side dish you prefer, eg. fresh salad greens, mash potato, potato wedges or etc. For my case, I served it with pan-fry sweet potato slices. 1. Halves the passion fruit, scrape flesh into strainer and push it through the stainer and get about 80 - 100ml of juice. Set aside. 2. After frying the salmon, use the kitchen paper towel to wipe the pan then add in the butter and saute the shallot till fragrant, about 1 minutes or less. 3. Add in cooking wine, passion fruit juice and honey then simmer on medium low heat till thickened, about 30 seconds then remove and set aside. a) The use of honey is for seasoning purpose as in sweeten and enhance the favour of the passionfruit and it also act as a caramelised agent to thicken the sauce. 1. Season the salmon with salt, pepper and passion fruit juice then coat it with some cornflour on both side then set aside for about 1 minute. 2. Heat up the pan with olive oil and butter then pan-fry the salmon, skin-side down for about 4 minutes on each side until cooked through. the timing will depending on the thickness of the fillet. 3. Removed the fillet and arranged on serving plate together with the side dish, salad and drizzle some passion fruit sauce on the fillet and served extra sauce on the side. I guess you have either heard or tried making or eating Tiramisu before. It is actually one of the most popular Italian desserts which is made of savoiardi (lady fingers) dipped in coffee and mascarpone cream. 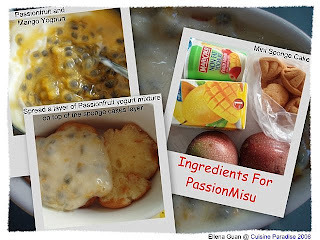 But for our this week menu, I am trying something new which I called it PassionMisu. The key ingredient use it Passionfruit as this weekend my blogging is base on cookign with FRESH FRUIT. 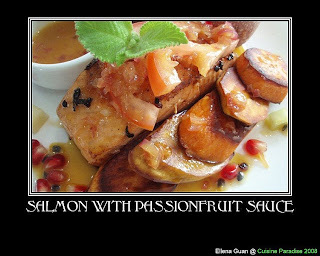 This PassionMisu is to serve with the main course known as Salmon with Passionfruit Sauce. For this PassionMisu dessert, I used mini sponge cake (kueh Bolu) instead of the traditional savoiardi (lady fingers). I dipped it in Mango juice and spread it with layers of Passionfruit yogurt cream. 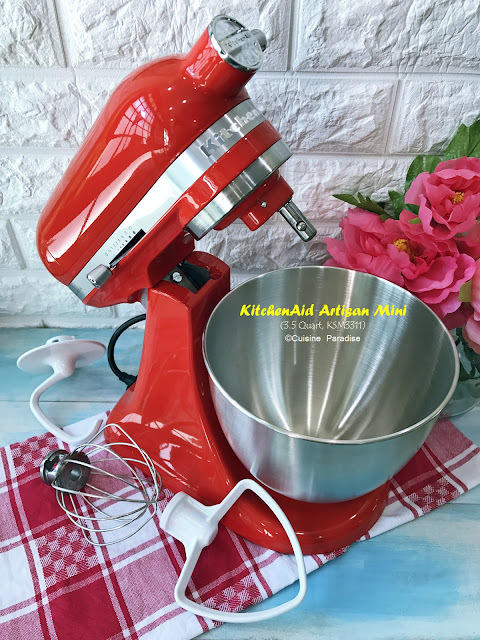 This is indeed one of the Quick and Easy way to make an easy and impressive dessert for guest. If you are not keen with passionfruit, you can always replaced it with the traditional Tiramisu ingredients like coffee and mascarpone cream. Or you can use this method by changing the type of fruits to either strawberries, mango or even durian and you can get a wonderful and easy dessert in no time. 1. Cut the passionfruits into halves and remove the pulps and set aside. 2. Cut the sponge cake into halves (side-way) then gently dip the cut side in the juice and arranged it in base of the serving cups or container. 3. Spread a layer of the passionfruit yogurt cream on top and top with another layer of sponge cake dipped with juice. 4. Repeat the top with another layer of the yogurt cream. 5. Wrap the top with clear wrap and put in the freezer for about 10 minutes to get the top almost firm to touch. 6. 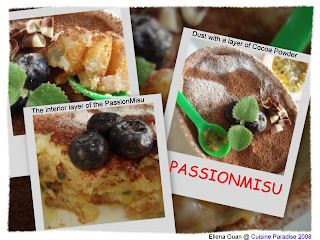 Dust with generous amount of cocoa powder and decorate with some fruits or extra passionfruit pulp if desire. 1. Dissolve the gelatin powder in the mango juice over simmering water or microwave on medium heat for 30 seconds(stop in between 10 second and stir till dissolve). 2. Next, mix the yogurt and passionfruit pulp together till well combine then stir in sugar and melted gelatin solution. 3. Set aside the mixture for spreading on the sponge cake. a) I arranged mine in a 2 oval baking dish which is 12cm by 8cm in measurement. Lavender is a genus of about 25–30 species of flowering plants in the mint family. The plant is also grown commercially for extraction of lavender oil from the flowers. This oil is used as an antiseptic and for aromatherapy. Lavender flowers can be candied and are used as cake decoration. Lavender is also used as a herb, either alone or as an ingredient it is also used to flavour sugar, the product being called "lavender sugar", and the flowers are occasionally sold in a blend with black, green, or herbal tea, adding a fresh, relaxing scent and flavour. 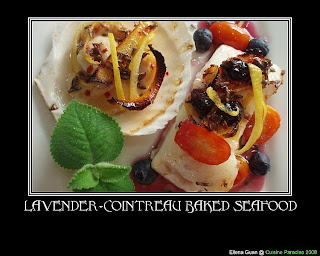 You can use this Lavender-Cointreau Dressing for baking other seafood like Prawn or Scallop. Since I still have some frozen scallop in the freezer, I took one of it to bake with the reminding sauce. 1. Rinse and clean the scallop well, pad dry and place it on a big of aluminum foil, fold the sides up to form a parcel so that the sauce will be within the foil when baking. 2. 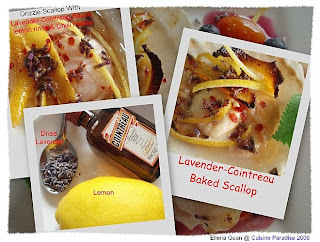 Top the scallop with lemon rind, Lavender-Cointreau Dressing and chilli flakes and baked in the toaster oven for about 3-5 minutes depending on the thickness. 3. Remove it from foil and place it on serving plate. 1. Wash and pad dry the cod fillet then place in on the middle of an rectangle aluminum foil, fold the four sides up to form a rectangle parcel so that the sauce will be within the foil when baking. 2. 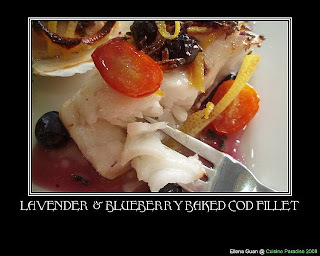 Top the cod fillet with blueberries, lemon rind, cherry tomato and the Lavender-Cointreau Dressing and baked in the toaster oven for about 7 - 10 minutes depending on the thickness of the fillet. 3. When the fillet is cooked, remove it and place it on serving plate and drizzle the sauce from the fish parcel to the fillet. 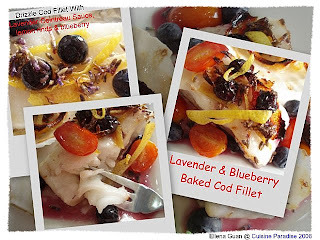 To make the Lavender-Cointreau Dressing, it's not necessary that you must have Cointreau. You can replace it with Grand Marnier or Orange Juice if this dish is to serve to kid. 2. Remove from heat and allow to cool then use it for drizzle over the seafood before baking. I believed most of us will fancy on Sweet Corn which is sweet and full of favour. You can either steam it and eat with a touch of butter or you can use it for making desserts or even salad. Corn contains beta-carotene, small amounts of B vitamins and vitamin C. It is a useful source of protein and is rich in fiber. 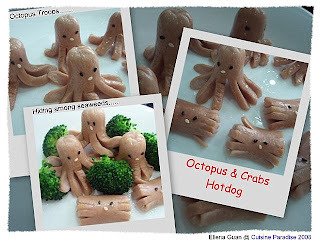 This afternoon, we will be having this cute and nutritious finger food to serve together with rice. I made these using Pork and Prawn minces with shredded carrot, water chestnuts and some seasonings. From the usual dumpling skin which used to wrap the filling and steam as we called it Shao Mai (click link to read more) or Siew Mai in more of the Chinese dim sum restaurants. 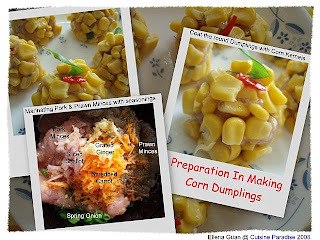 I replace the dumpling skin with corn kernels which will give it a new look and also increase the texture and favour of this dish. 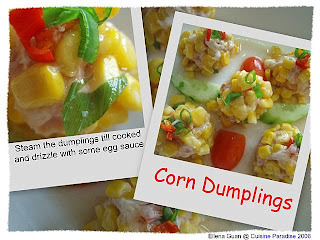 I am sure most of the kids will love this dish because of the corn kernels and it's colourful appearance. This is also another good method to put vegetables and meat together for kids to consume. 1. Mixed all the ingredients(except the corn kernels) and seasonings together till well combine and set aside in the fridge to marinate for at least 1 hours or overnight. 3. Set aside on a steam plate and continue with the rest of the rolling and sticking. 4. 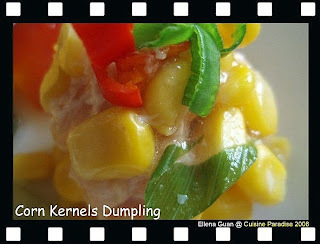 Steam the corn dumplings on medium heat heat for about 7 - 10 minutes depending on the size. 5. Slowly remove it from the steaming plate and arrange them on the serving plate and prepare the drizzling egg sauce. 6. To prepare the egg sauce, preheat a small frying pan or sausage with some oil, add 1 teaspoon of oyster sauce and let it bubble for a few second then add in 60ml of water, and stir till the oyster sauce is mixed through. 7. Next, slowly add in one tablespoon of beaten egg white and stir until it change colour then add in some cornstarch water to thicken the sauce. 8. Use a spoon to drizzle the sauce on top of each arranged corn dumplings, top with extra chopped spring onions and chillie and serve. a) You can replace the chopped chillies to Chopped Carrot for the topping if this is to serve for kids. b) To make the prawn mince, you can either chopped the shelled prawn using the back of the knife or you can put it in the food process and blend it together with the pork mince and seasonings. 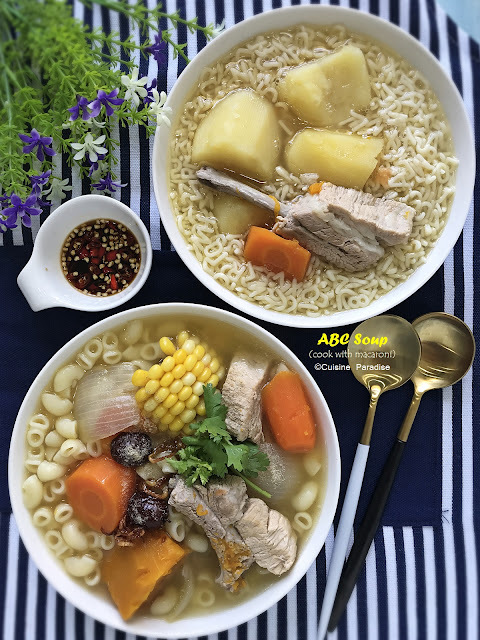 c) To make an easy egg sauce, you can used ready stock pack and just pour the chicken stock into a small saucepan and then before it begin to boil, stir in the egg white and thicken with corn starch. A wonderful and healthy lunch is just as important as a hearty breakfast. Today is Monday, the starting of the week again so I decided to make something hearty and healthy for lunch. Since I have bought some shave honey baked ham and wholemeal bread on Sunday. 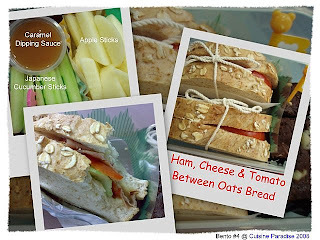 I decided to some ham and cheese sandwich to go with the apple and cucumber sticks for lunch. My son and I love the Apple Dipper from Mac Donald so I got the idea of making my own Apple and Cucumber dipper with Caramel Sauce and it really taste great for a starter. I have slightly toasted the bread slices before adding cheese, ham, tomato and cucumber slices to it. I wrap it nicely with foil and baking paper then tie with baking string to that they can sit up straight side by side. As for the dessert, I serve it with two cubes of the Macadamia Nuts & Chocolate Fudge Brownies which we made on Sunday afternoon. Made this Macadamia Nut & Chocolate Fudge Brownies this afternoon based on the same recipe that I used for Dual Chocolate Fudge Brownie(click here for recipe). This round, I add in macadamia nut instead of white chocolate and I had reduce the oven temperature to 170 degree instead of 180 degree. I cut short the baking time to about 23 minutes and it did improved the inner texture a bit but then it is still not as sticky as I expected. Maybe I shall try to reduce the timing to about 18 - 20 minutes instead and add in maybe another one more row of chocolate..... hehehe... Overall this round it did taste better, more moist and soft. Reyon ate two slices immediately after it is slightly cool off from the tray. 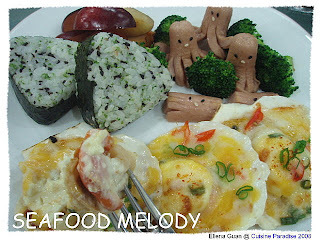 Seafood Melody is our this Saturday weekend dinner theme. 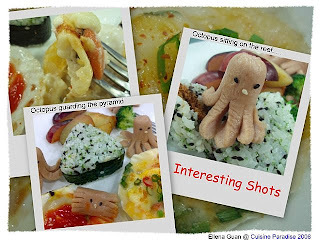 We have Baked Scallop on shell with Cheese, Seaweed Onigiri wrapped with fish floss, Octopus & Crab shapes mini sausage and lastly serve with prunes wedges which is in season. At 1st my aim was to make some Fish Shapes Onigiri with my fish mould but too bad the shape doesn't come out nicely so I had to change it to normal triangle shape. As you can see, I added some stir-fry Broccoli among the octopus and crabs to act as seaweeds for them to rest on. I made these cute little Octopus and Crabs to enhance the sea creatures theme. (which is not really look like crab but more like kitty according to Reyon and one of my blog pal hahaha....). Reyon and I really enjoys ourself on making these cute little creatures, we decorate the eyes and noses with black and white sesame seeds which creates different kinds of facial expression. I found these frozen scallops on shell at one of the local supermarket upon a friend's recommend. 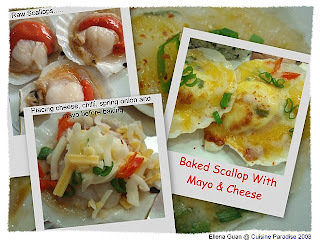 It's really worth to spend that amount for these nice and juicy scallop which I baked it with some easy ingredients in the pantry. 1. Defrost the scallops completely, rinse well and pad it dry with some kitchen paper towel. 2. Place about 1 teaspoon of mayonnaise cream on the centre of the scallop, sprinkle some chopped onion and chillie. 3. Top with some shredded cheese and grill for 3 - 5 minutes until it is cook through depending on the size of the scallop. 4. You can added some extra cheese after 2 minutes or so for extra cheesy taste. 1. If you do not have any Japanese Mayonnaise, you can use any type of mayonnaise or thousand island. 2. If this is serve for kids, you can omit the cut chillies. 3. You can replace the chopped spring onion with chopped brown onion. 4. Use any type of cheese that you can find in your fridge, for this I used Mozzarella Cheese. 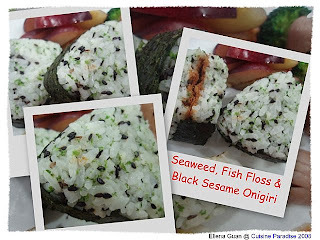 For the rice dish, I used the Seaweeds flakes and Black Sesame seeds to combine with the cooked rice then use the triangle Onigiri mould to shape it. I also add some fish floss filling in it to enhance its favour. Another day of Simple lunch bento. 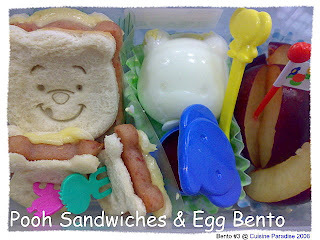 Today's menu will be Pooh Ham and Cheese Sandwiches served with Pooh Head print hard-boiled egg and some Prunes wedges. 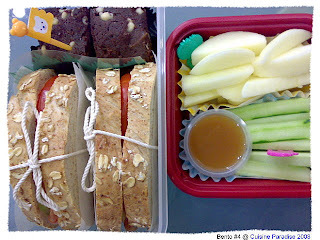 I starts to find it so interesting to prepare our own bento lunchbox. Although it might be just some simple food but the taste and sight is much more heart warming, nothing compare to homemade lunchbox especially it is with the help of my little Reyon. Bento is a single-portion takeout or home-packed meal common in Japanese cuisine. A traditional bento consists of rice, fish or meat, and one or more pickled or cooked vegetables as a side dish. And it is still common for Japanese homemakers to spend considerable time and energy producing an appealing boxed lunch. Recently a few of my blogger friends and I are sort of into the Bento craze, we are so impressed by a few of the bento bloggers and we also start to try preparing our own lunch bento. For the start of the week which is a Monday, I choose something easy, sweet and colourful to brighten up the week. Reyon and I are very excited about preparing this bento lunch. After making the Chocolate Fudge Brownie, we starts to source for a suitable box, the shape of Onigiri mould, the fried rice ingredients and etc. 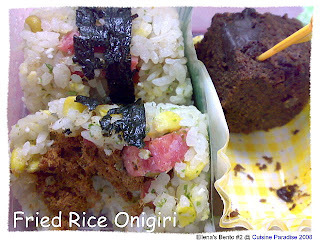 I wrapped the fried rice Onigiri with either Fish Floss or Sandwich Cheese then decorate with Nori sheet. 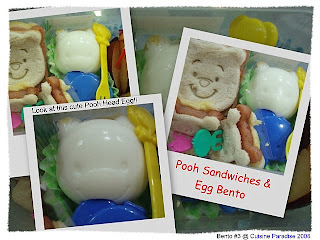 And this is the 2nd time that I have prepared bento to work, the very first round is making the Mini Pooh Bento Box for my colleagues as snacks. 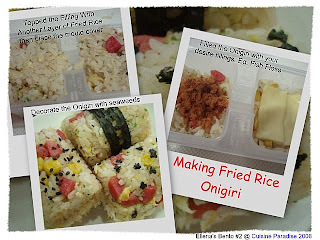 This show a cross section of my Fish floss fried rice Onigiri. 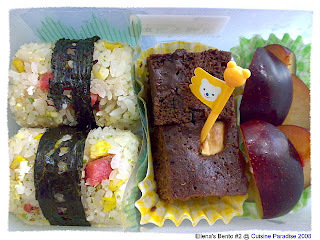 I packed my lunch bento with 2 fried rice onigiri, 2 square cubes of chocolate fudge brownies and some prunes wedges. Although it's a very simple lunch bento but I think it is definitely more healthier than those outside food.